in Pattern stitch, stretched when worn. See notes. 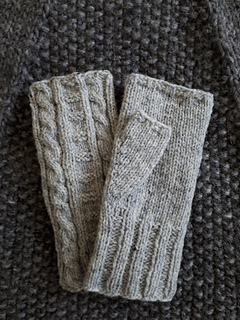 Fits hand circumferences 7-7 1/2-8"
Fingerless gloves have always had an aura of romance for me, conjuring up images of nineteenth-century heroes and heroines in chilly garrets or country houses, but until recently, I avoided wearing them. They seemed impractical—not enough coverage to keep fingers warm on a cold day outside, and unnecessary indoors. Then I moved into an early Victorian limestone house with a frosty third-floor library. Now I’m a convert. 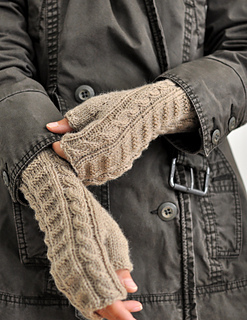 With these gloves on I can type or knit, and with warm wrists, the rest of me stays toasty. The snug fit ensures they don’t get in the way of busy hands. A thumb gusset positioned slightly toward the palm prevents the patterned back from torqueing out of alignment, and detailed instructions ensure a tidy join between thumb and hand. The stitch pattern is adapted from the gansey stitch, “Filey Steps”. Note that in order to maintain the feel of the original stitch, the cables are deliberately not mirrored within each glove; instead, each glove mirrors the other. By switching yarn weights and needle sizes, a single set of instructions becomes a “one size fits most” pattern, from small women through to medium sized men. then GO DOWN TWO NEEDLE SIZES. S and M take 1 skein of Chickadee. L takes 2 skeins of Owl or Owl Tweet, although only very little of the second skein.